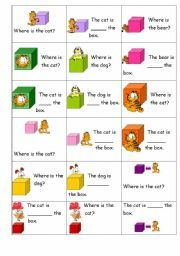 Flash cards of place - two types - one with a question where you can form the answer and one with the sentence with the preposition missing. Cut and paste exercise with preposition of place. Part 1 of 3 - opposite flashcards using same pictures (a few extra ones) as opposite dominoes except here the question is asked "what is the opposite of _____?". 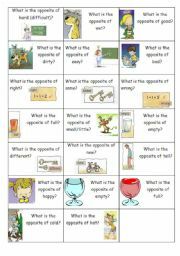 Can be used in quiz games, or for self revision. Part 2 of 3 - opposite flashcards using same pictures (a few extra ones) as opposite dominoes except here the question is asked "what is the opposite of _____?". 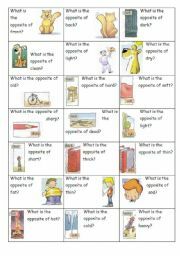 Can be used in quiz games, or for self revision. Part 3 of 3 - opposite flashcards using same pictures (a few extra ones) as opposite dominoes except here the question is asked "what is the opposite of _____?". 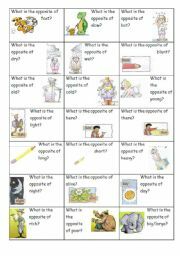 Can be used in quiz games, or for self revision. Part 1 of 4 - opposite dominoes - cut them so that 2 squares are still attached to each other. You can also resize them to half the A4 page as well so that 24 squares will fit on one page depending upon age of children. It is also done as the above because of size of file. Part 3 of 4 - opposite dominoes - cut them so that 2 squares are still attached to each other. You can also resize them to half the A4 page as well so that 24 squares will fit on one page depending upon age of children. It is also done as the above because of size of file. Part 2 of 4 - opposite dominoes - cut them so that 2 squares are still attached to each other. 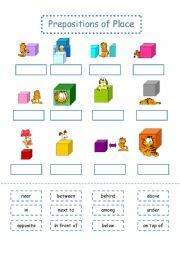 You can also resize them to half the A4 page as well so that 24 squares will fit on one page depending upon age of children. It is also done as the above because of size of file. 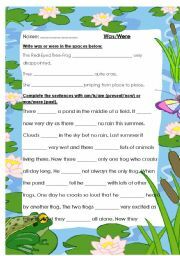 cloze worksheet with frog story - students need to put in either was/were in the spaces.